The college football world had a big shocker Saturday afternoon with 3 of the top ranked schools (Michigan, Washington and Clemson) losing important games to unranked opponents. After Saturday’s crazy upsets, Alabama remains at #1 and Ohio State jumps to #2 in the polls. 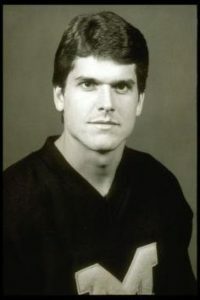 Michigan’s coach Jim Harbaugh is a true competitor and hates to lose (especially by a last minute field goal). Clearly losing on Saturday to the Iowa Hawkeyes would have been hard on its own, but to add insult to injury, the last time Michigan lost to Iowa (by a last minute field goal), was 31 years ago when Harbaugh was Michigan’s QB and the Hawkeyes’ head coach Kirk Ferentz was Iowa’s offensive line coach. In the NFL, the most dramatic play of the weekend was by the Denver Broncos Safeties Justin Simmons and Will Parks. After a touchdown from the New Orleans Saints, the game was tied 23-23. All the Saints needed was an extra point (normally a formality) to win the game. The Broncos defense, however, took the game to a whole new level with a remarkable leap by Simmons to block the kick while Parks ran the ball in for a TD (giving them 2 points). The new rule allowing the defense to gain 2 points after a blocked field goal has only been in existence since March of 2015. And, oddly enough, the first team to have benefited from the rule was none other than the Seattle Seahawks last December. Weird coincidence or Karma? Sunday night’s game featured a rematch of Super Bowl XLIX between the Seattle Seahawks and New England Patriots. The game came down to the wire (again), but this time the Seahawks pulled out a win with three touchdowns by WR Doug Baldwin and an impressive defensive stance at the goal line preventing the Pats from coming from behind to win (as they did in SB XLIX). Seattle 31, Patriots 24.